Heavily textured foliage gives the Chatham Island Forget Me Not year round appeal. The sky blue flowers from mid spring to summer are an added seasonal bonus. The leaves are large, glossy green and heavily veined which gives the plant texture. The flowers rise above the foliage, a waxy sky blue and white. 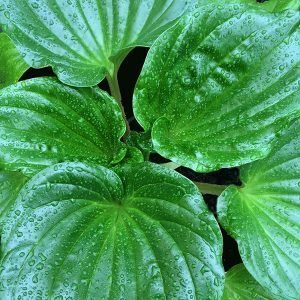 This is an outstanding garden plant and is well worth searching out for its large deep green glossy foliage (over 30cm across) alone, as well as the beautiful blue flower heads that appear in spring. The Chatham Island Forget Me Not (Myosotidum hortensia) is an evergreen perennial and a native of New Zealand, yes the Chatham Islands, where they grow naturally in an open coastal situation. These stars of the garden are available for sale as seedlings or can be grown from seeds. In the right growing conditions, the Chatham Island Forget Me Not thrives. It requires shade, a frost free position and a humus rich well drained soil. Probably best grown in a position where it gets good shade especially in the afternoon, a humus rich moist soil. The the Chatham Islands are further south than Hobart, so mainland Australia tends to be a bit warmer than this plant likes, hence the part shade. Try a liquid seaweed fertiliser for great results. 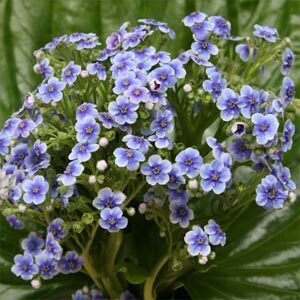 Although not a long lived plant these wonderful specimens will self seed and in the right conditions will provide an ongoing display of green foliage, and of course those beautiful blue ‘forget me not’ flowers that rise above the foliage in spring to early summer. As far a companion plants, think Hostas, hellebores, Bergenia. If you do manage to get seedlings, we suggest growing Chatham Island Forget Me Nots or Myosotidum hortensia seedlings in a container for the first year for a little added care and attention.